Most noteworthy among the competitors is a return to the fleet of Lin Cenholt and CP Lubeck (DEN). CP was injured this winter from a foil strike while racing in Auckland, and after rehabilitation is back in the game. As a class we are thrilled to see that CP has made a full recovery and is back where he is happiest, racing! Lin and CP actually made their return last week at Kieler Woche finishing 5th, so all that time out of the boat hasn’t pushed them off the pace! Odds on favorite for the championship must be the understated Italian duo of Rugerro Tita and Caterina Banti. 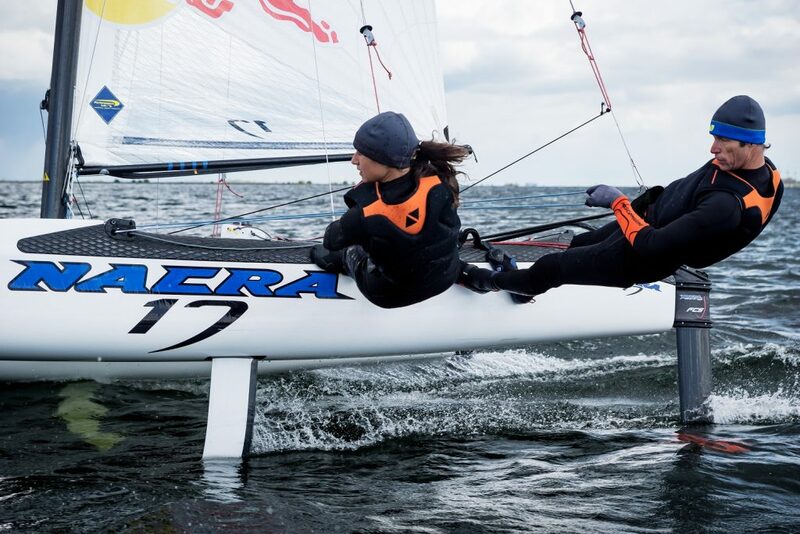 The blazing Italians did not compete in Kiel last week, but have been the clear standouts in the class since foiling began, and are defending European Champions. 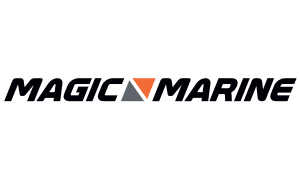 This season they’ve also managed to win Palma, Hyeres, and the Sailing World Cup Final in Marseille… each of the regatta’s they’ve entered! With an undefeated streak like that, there is little doubt they’re aiming to defend their title. 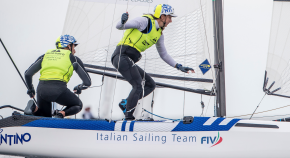 The Italian duo are silky smooth on the water, and always on pace. They have pace in the light, pace in the medium, and pace in the breeze. They are stable on their foils and great off the line. There seems to be no hole in their overall game, and will be tough to beat. Chasing the Italians hard are a hoard of Olympic medalists from Australia and Spain. Fernando Echavarri, the 2008 Tornado Gold Medalist with Tara Pacheco won Kieler Week just one week ago, and took the Bronze at least years European Championship. Iker Martinez, the 2004 49er Gold Medalist with Olga Maslivets have also been racing hard this spring. Then from Australia are another pair of medalist teams. Silver medalists from Rio, Jason Waterhouse and Lisa Darmanin finished as runners up last week in Kiel, so are clearly on the pace. 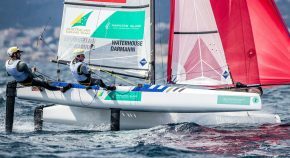 London Gold Medalist and Rio Silver Medalist from the 49er, Nathan Outteridge, has teamed up with his sister, Haylee Outteridge, and is out racing the Nacra 17 this summer. Despite fewer than 20 training days some are claiming they’re already the fastest team doing downwind, and they managed to finish ninth in Kiel last week in a scoreline that included two letter scores from a collision on the first day. Yes, there is a trend here. 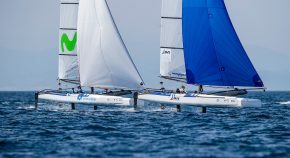 It seems the Nacra 17 is becoming one of the destination classes for top Olympic talent. When the whole fleet is together, there are six Gold Medalists and the same again Silver and Bronze medalists all competing, quite the pedigree! While historical achievements are noteworthy, there are plenty of top contenders looking for their first medals. Ben Saxton has recently reunited with Nicola Boniface and a last years World Champions they are clearly a threat. They are challenged by countrymen John Gimson and Anna Burnett, who won Kiel week and have been steadily climbing up the rankings all season. From America there are also a duo of contenders, with Bora Gulari and Helena Scutt getting back into regular racing after a rash of injuries spread between the two of them since their campaign began. Their countrymen, Riley Gibbs and Louisa Chaffee, are also moving into contender status with top 10 finishes in each of the past two major competitions. In all there are 57 teams racing here in Poland and there will be more than 70 next month at the World Championship in Aarhus. While the transition from the 2016 boats to these fully foiling boats has been challenging, the fleet size is now up by almost 60% from the end of last quad, and sailor are having more fun on the water than before, which is surely a good thing for any fleet.